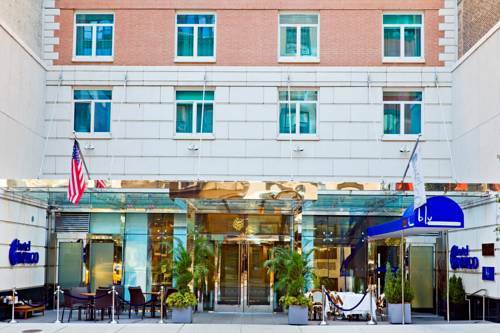 Follow the perfume of flowers and the unforgettable vision of high fashion to our unique boutique hotel on the cusp of two creative neighborhoods: the Hotel Indigo New York City Chelsea hotel. Artwork throughout our space represents the diversity of our neighborhood, and youll find the fashion-forward everywhere in our d cor even the headboards have their own style. Our hotel is designed to provide a refreshing environment, with spa-inspired bathrooms and comfortable beds. Explore fantastic shopping and art galleries just steps away, or hang out in style at our rooftop bar (appropriately named The Roofbar) or grab a bite at STIX, where our dishes crafted from local ingredients attract an eclectic mix of guests and locals. Penn Station offers national trains as well as tri-state local trains running on the Amtrak and Acela lines. Driving Range and Putting Green open. Simulation golf courses available.